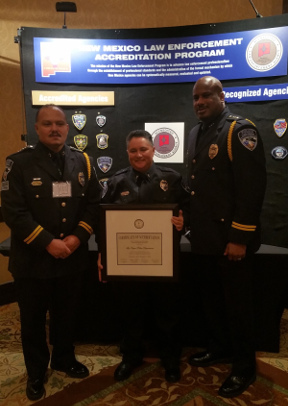 LAS VEGAS, N.M. - Dec. 15, 2016 - PRLog -- The Las Vegas Police department has been re-accredited by the New Mexico Law Enforcement Professional Standards Council. The accreditation process is a thorough one. LVPD Police Chief Juan Montaño said that a review team performed on-site inspections of everything from equipment to police files and written policies before making their decision. They also required proof that policy and procedures were being followed. The program, which is voluntary, was developed jointly by the New Mexico Association of Chiefs of Police, the New Mexico Municipal league and the New Mexico Self-Insurers Fund. It is intended to insure the highest standards for New Mexico law enforcement agencies, and addresses every component of the agencies involved. Securing accreditation reduces the city's potential liability, and hence, its insurance rates. Montaño estimated annual savings for the city at $50,000. Chief Juan Montaño, Lieutenant Pam Sandoval and Deputy Chief Ken Jenkins were presented with the seal of accreditation on Dec. 7 at a ceremony in Albuqerque.